​Women in space - finally! Historically, women have had very different roles than presently in the workplace in the US. Have students explore the history of women in the workplace in this country. What events influenced the expansion of women's roles in the workplace? Does a bias still exist? Ask students to choose a different country and compare it to the US. What are the similarities? Differences? Why? What are the factors that historically influenced occupations for women? Use this Minute to explore the science behind gravity and g-force. Try out these experiments and make sure you look at the resources linked at the bottom of the experiment’s web page. This Minute references the song “Ride, Sally, Ride” from 1966 that became the music associated with this first American woman in space. NPR even included a clip of the song with her 2012 obituary. Have students explore other music that becomes the background for pop culture and current events. Have them choose a song they would like associated with themselves and justify how if is a reflection of them. Author Whiting tells the reader that Sally Ride could have pursued the professional tennis circuit. Tennis is considered a “lifetime” sport - something that can pursued throughout one’s life - not only when at school or on community based youth teams. Have students brainstorm a list of lifetime fitness activities and identify those which they can see themselves participating in long after their academic career has come to a close. NASA maintains a site full of resources for students. Check out the two pages on Sally Ride (K-4 and 5-8). Be sure to point out the .gov domain extension in the URL that is reserved for government websites. 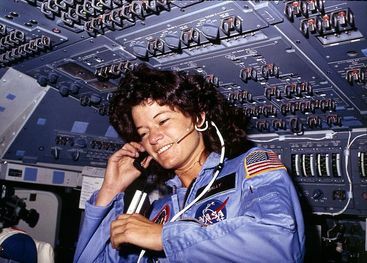 Show students how to search this domain for other information about Sally Ride [add site:.gov to your Google search and it will only return results from .gov sites]. They will have to go beyond the first pages of results to find things other than NASA provided information.